1st Day is Ganesh Chaturthi and 10th day is Visarjan, Between are 1 and half, 5th and 7th day of Ganpati Visarjan (Idol Immersion) as per Hindu traditions. This last day of Ganpati Immersion is full of fun and is celebrated on large scale in Mumbai. Below is a guide to help you understand what it is and which places to visit during Visarjan day. Some tips on what to do and what not when it comes to such crowded event..
Mumbai is blessed with beaches, Few of which are major attraction during Ganesh Visarjan. In fact, Every other pond, lake in locality are used during visarjan during Ganpati festival which is one of the major event of the year. Below are some of the listed places to visit (Beaches, Lakes) during 5th, 7th and 10th day of Immersion where top pandals ganpati comes with procession. Girgaum Chowpatty : The one and only beach of South Mumbai where giant Ganesh idols are immersed traditionally. All famous and top pandals makes their way to this beach on 10th day, the last day of this festival. On 2nd, 5th and 7th day, Personal home Ganesha, Society idols and other small pandals come to the beach. But on 10th day, million or more people are around south Mumbai moving towards beach, Event starting by afternoon till next day morning. A special note for foreign tourists who wants to enjoy Ganpati visarjan on this very 10th day. At Girgaum chowpatty, a huge elevated stages with shade and other basic facilities like toilet and drinking water etc is set up every year by ‘Maharashtra Tourism Department’. From here, easy and complete view of all ganpati idol and visarjan is seen. A prior booking has to be made on MTDC website or can be contacted via their email : reservation@maharashtratourism.gov.in and Contact number : +91-22-22044040. Dadar Chowpatty : The South Mumbai location has one more beach near Shivaji Park. This beach is most preferred by residents and big pandals of Dadar and near by stations pandals. Dadar TT Circle and others in East also come to this Chowpatty. Juhu Beach Andheri : For those looking out for grand visarjan in Mumbai suburban, Juhu beach is the best place to visit. Versova Beach Andheri : Adjacent to Juhu beach is Versova which can be seen easy. Big, Small and Medium pandals of Lokhandwala, Versova, 4 Bungalow prefer this beach and few to goto Juhu. Versova is a fishing beach for fishermen of Mumbai suburban. Powai Lake : Connecting Western and Central Suburban is this beautiful Powai lake located between high rise and elite group residents. Nearest railway station to reach is Andheri (East side). Marve, Gorai, Aksa beached and Bhayandar Creek : In North suburban beyond Major locations and beaches of Andheri comes stations like Borivali, Kandivali, Malad and Goregaon. The interiors of this locations is connected to huge beaches and beautiful waterfronts. Like other beaches of Mumbai, These suburban beaches attract crowd on Visarjan days. The only difference is that Girgaum chowpatty is the only place where top and famous Ganesh pandals go for Immersion. Security is beefed up with thousands of police patrolling. Hundreds of CCTV cameras, Many drones are on work for everyone’s safety. Trust me, Without official declaration of Holiday or a close down, Most and major business in Mumbai city are closed on 10th day of Ganpati Visarjan. Streets looks empty from usual crowd, Shops are closed. Its a mega event after all. Let me take you to a small visarjan tour in best possible way i can with below written guide (So not miss the videos at end of article). Day 10th, Afternoon in South Mumbai (Locations like Girgaum, Lalbaug, Chinchpokli, Khetwadi, Marine Lines, Grant Road and Mumbai Central) major pandals who are getting ready and making all necessary provisions for a long Visarjan procession which goes for hours are excited since early morning. Major decoration and Lightings around huge ganesh idol are getting unplugged so that it can be moved / shitef on a safe vehicle and its time for a final Pandal Aarti (Ritual) to take blessing and say good bye to the elephant god. A huge van (truck usually) is decorated with flowers and other stuff and is kept ready. All pandals are aware of Mumbai traffic restrictions and routes from all major location to Girgaum beach as declared in major leading newspapers and twitter handle of Mumbai Police in prior. Hundreds of members from each pandals, Adults, Kids, Girls and Boys are dressed up in Common that reflect perfect group and unity that is moving for the immersion rituals. Most groups wear printed Tshirts of Blue, Yellow and Orange colour with Ganesh Pandal name printed in Marathi language. You will love to see and authentic dressing of few groups, Females wearing Nauvari Saree and Male wearing Kurta with Nehru Cap and sun glares. Kids left no space in dressing up the best. Another group (Dhol Tasha Group) is already ready with music instruments like Nashik Dhol (See one of the best captured video below at Girgaum, previous year). Most shops except (Refreshment stalls, Restaurants and other eateries etc) are closed. Major malls are closed on Visarjan day. At every other junction, Political parties has set-up their stage with banners displaying party name and local politicians. They distribute free water and snacks like Vada Pav etc. Private society and some trusts also arrange for drinking water and other eateries at many street side locations and below society premise. The Huge Idols of Ganpati moves ahead by 3:00 in the afternoon (Some before and after, No fixed timings). The sound of Nashik Dhol, Banjo is all around at every other lane of Mumbai with groups in huge and equally are the spectators out with family and friends to enjoy all the fun and capture moments in their camera for this mega festival event. There are lots of selfie moments seen with every other beautifully decorated Ganpati idol while moves ahead. Huge trucks, Dhol and Banjo are Chaotic and few do crossed the noise pollution level ideal and within legal limits. Kids : If you have kids, It is recommended to not join the exhausting visarjan processions. The crowd is huge and for kids visibility is low near Chowpatty and around crowded locations as detailed. Kids can get really exhausted looking at same and walking so much. Parents need to take this as an important note. 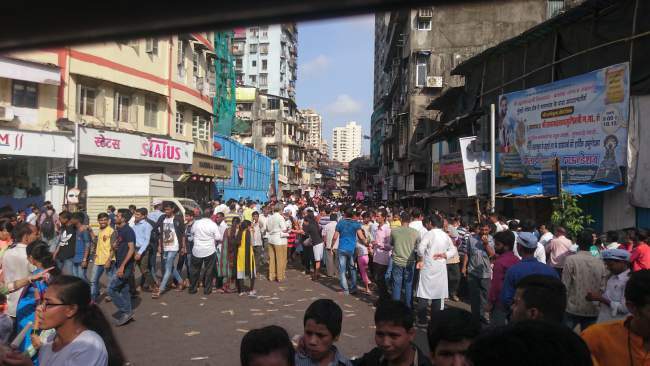 Avoid Road Travel : In South Mumbai (Between Mumbai Central / Tardeo till Colaba) and Major near Chowpatty area like Girgaum, Khetwadi, Opera House etc major routes are blocked for regular traffic and diversions are made for smooth and secure visarjan process that last till early morning next day i.e 11th day. Avoid travelling by road and Hop on to the Local trains, Here are the train schedules. Best Location to See Ganpati Idols : Main areas from where one can see major Huge Ganesh idols of famous pandals in Mumbai during visarjan are SVP Road (Sardar Vallabhbhai Patel Road), Khetwadi, CP Tank, Goldeval, Kalbadevi, Warerkar Bridge that ends to Chowpatty (Please refer Google Map for same). Timings : Early evening (i.e Between 4:30 to 6:30) crowd starts rolling out on Mumbai streets. 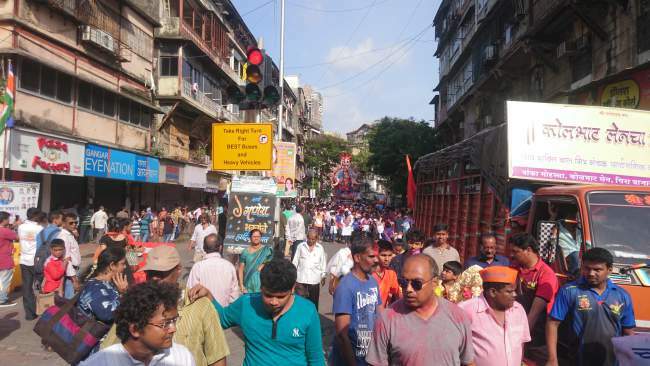 The pandal groups starts reaching Girgaum chowpatty beach, People rushes in from all side towards beach which finally has a common restricted entry for public visitors. Excitement is high, Its getting dark but the sunset makes no difference as the crowd is still increasing and complete beach area is glorified with hundreds of big halogen lights. One after another, Huge idols with beautiful sculpture and theme reaches the beach. Helicopters are rolling over the promenade to keep watch on people safety who are entering the water tides with idols. This goes till early morning the next day. Nearest Stations : Grant Road and Charni road are the best nearest railway stations to reach Girgaum Chowpatty beach. Special trains are scheduled from evening till mid night i. 2:00 Am. For long distance visitors like Vasai Virar and others, I would recommend to reach Grant road station once you are done with all the Darshan and visarjan fun. 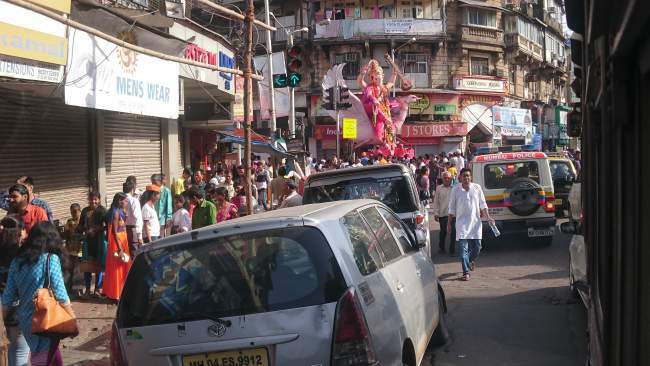 With fun, Ganpati visarjan days (2nd, 5th, 7th and 10th) brings in the worst of chaos and noise pollution to city. In 2018, Awaaz foundation has reported as high as 112.6dB sound on Mumbai’s 5th day of visarjan as detailed in leading newspapers. Such an high frequency is usually recorded in Rock and Music concerts. Usual everyday traffic jam brings in about 70dB of noise pollution which is an regular affair. According to noise pollution rules, No residential location should flaunt any type of sound level above 55dB between Morning 6:30 till 10:00 at night. Between 10:00 Pm and 6:30 Am, noise limit should be 45dB. Now let me help you with the musical instruments used during visarjan that brings up all this fun and excitement that people cannot control dancing. Few of these creates high level of noise pollution too. DJ sound system (Banned since 2018) which has 3 to 4 and more huge speakers with tappy bollywood music, item songs and famous marathi songs like Zingat etc played. Nasik dhol (A drum set) is a beautiful set of drums and its really fun to dance of the beats, It is the second largest seen musical instrument during Ganesh visarjan. When experts play it sounds really nice, But if a group of amateurs play it, Its Chaotic. Banjo is another favourite that many mandals prefer.